I have always loved Christmas, but this year has been even more fun now that I have a kid. This morning, J and I needed to make a run to Toys R Us to pick up a couple toys for L. This year is pretty easy because we can bring her with us when we buy toys and she really won’t know the difference. Since we had to head to the other side of town, we decided to pick up breakfast somewhere along the way. Well, actually it was more like lunch since it was after noon, but on Sunday (as I’ve said many times) it’s acceptable to eat breakfast any time of the day. 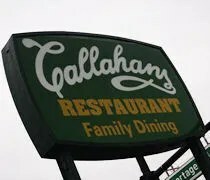 The restaurant I chose was Callahan’s Family Restaurant on Portage Road just to the south of the I-94 interchange. 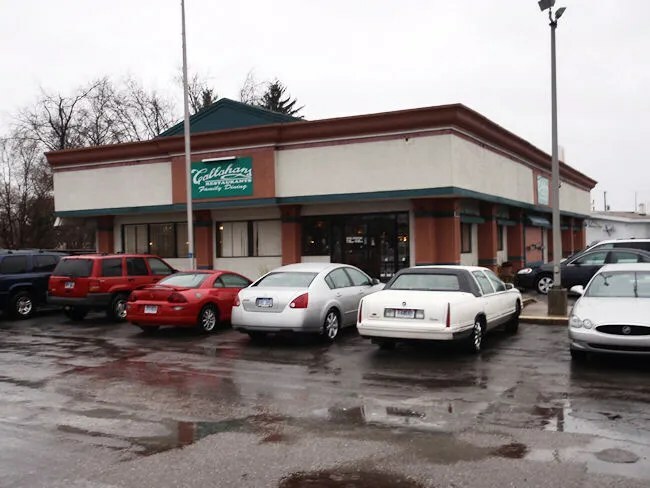 Callahan’s is a pretty typical family restaurant. You know the type. Dated decor. 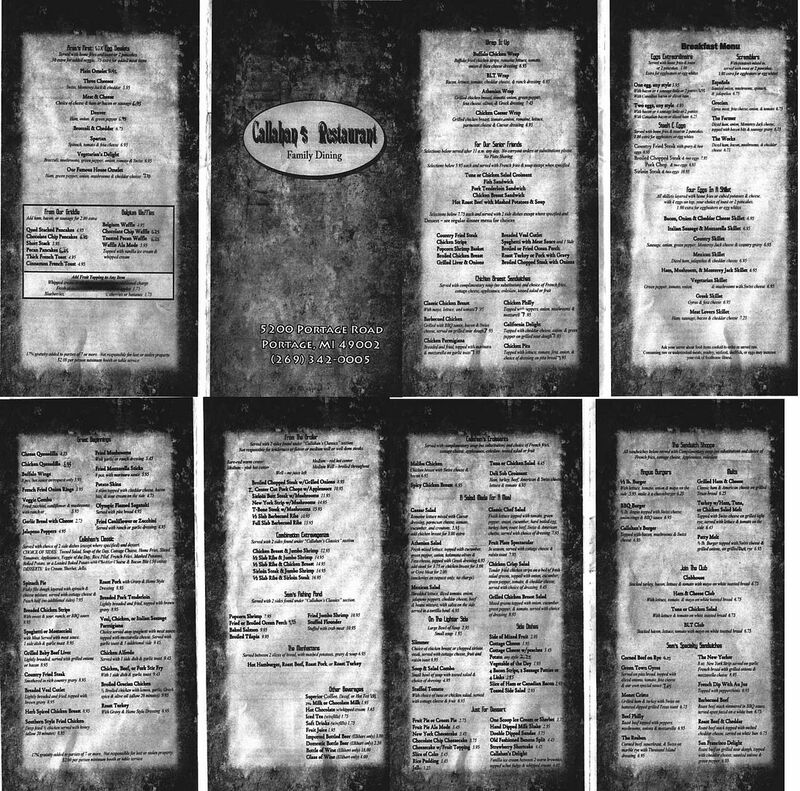 Standard menus. Just nothing super special. We walked in a little after noon and were shown to a booth back near the kitchen. A bus boy brought over a high chair while our waitress grabbed a couple glasses of water. She set those down then asked about drinks. I ordered a Coke while J got an Iced Tea. I kind of skimmed over the lunch menu while our waitress was getting drinks, but eventually went back to breakfast. It’s been quite a while since I’ve had a good burger, but I wanted breakfast. My choice was, of course, the Steak and Eggs. They actually have four steak and eggs options. I went with the Sirloin Steak over the Chicken Fried Steak, Chopped Broiled Steak, or Pork Chop. 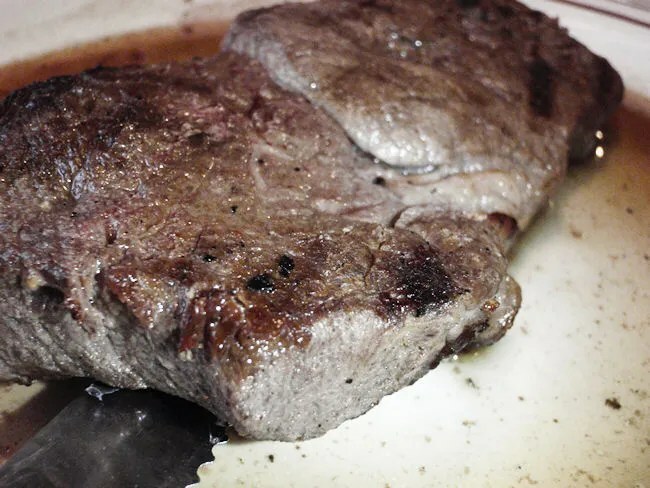 The slice of meat was pretty large and cooked perfectly with just a hint of pink in the center. It was surprisingly juicy, but a little tough in some parts. It had a really good seasoned crust that didn’t need steak sauce to make it taste good. 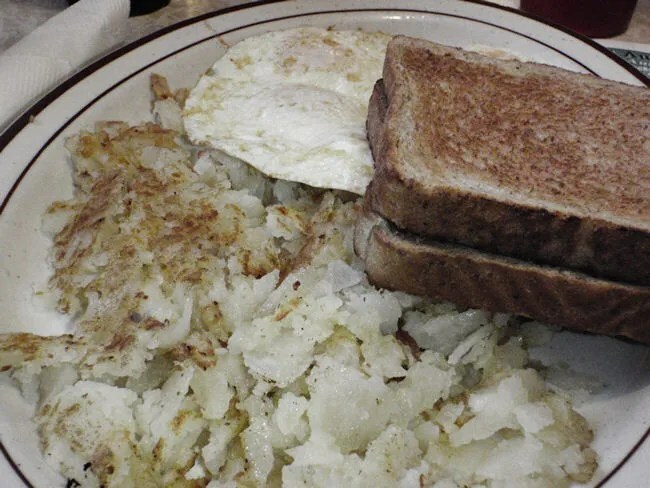 On a separate plate, the four eggs, hash browns, and toast are severed almost overflowing off the plate. I didn’t really touch the home fries. They were undercooked for my liking. The four large eggs were, again, perfectly cooked with a slightly runny yolk. A little hot sauce on top made the eggs a little more yummy. The toast is served whole (not cut in triangles) and slathered with melted butter. J was leaning towards Omelet (served with SIX eggs), but changed her mind at the last minute and went with one of the Four Eggs in a Skillet. 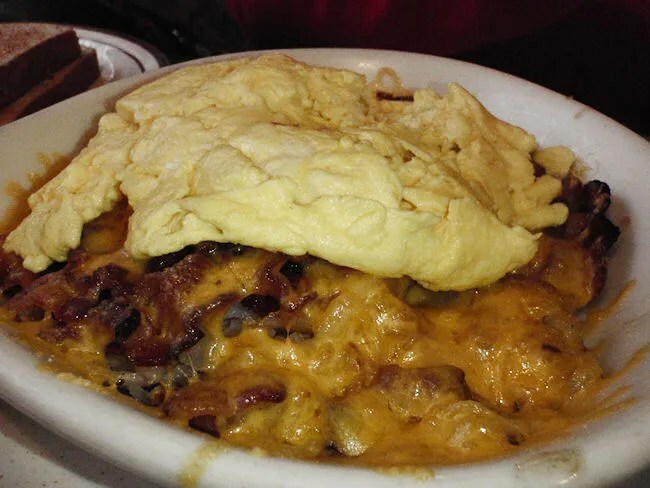 The skillets are layered with home fries, cheese, and topped with 4 eggs. J chose the Bacon, Onion, and Cheddar skillet without the onion. She got the eggs served scrambled and shared with L. J figured L ate at least two of the scrambled eggs while J went through the rest of the skillet. She said it was pretty tasty and seemed to enjoy it. Her meal also came with toast and we added on an extra order of dry toast for L which the waitress didn’t charge us for. Our bill was a little over $22, but I probably got the most expensive item on the menu. Callahan’s was a pretty solid Sunday morning choice. There’s really nothing that makes it stand out from all the other breakfast joints in town, but we did have a pretty solid meal. I’ve read reviews about service being an issue, but our waitress was always right on top of things. We were in the restaurant probably less than a half hour and we left with full tummy’s, so I can’t complain about a whole lot.